Welcome to the Wednesday Hodgepodge! If you've played along this week, add your link at the end of my post before you run off into the sunshine. And please go say hi to the blogger who linked before you because we're friendly here. 1. What's the first image that comes to mind when you hear the word 'spring'? Which phrase best describes the season of spring where you live right now (today)-sprung!, almost there, or still waiting? When I think of spring I think of crocus peeking through the snow, the fabulous way it feels to leave the house with just a light jacket as opposed to a parka, gloves, and muffler, daylight lasting a minute or two longer every day, and hope. Spring always feels so full of promise. As far as the season here currently? Pretty much still waiting. We're having warmer temperatures this week, but it's still not spring. We have literal mountains of snow all around, and not a speck of color anywhere. I did hear a bird singing when I took the rubbish out to the curb this week, and I noticed. I stopped and listened and it made my heart happy. 2. Bed, couch, stapler, garage door, computer mouse, recliner, flashlight, door knob...which household item containing springs most needs replacing in your home? Speaking of springs...dis you ever own a slinky? We have a doorknob in our house that I'd like to replace. It works, but is just one of those things I'd like to replace. When your house is for sale that's exactly the sort of thing that gets done too. What's next? I'm sure I'll have more to say about this, but in the meantime, see #3. Not gonna lie... I have a sweet tooth. I don't feel like the word 'freak' applies, but I do enjoy a sweet treat now and then. Everything in moderation, right? I don't drink soda, don't add sugar to my coffee or tea, and I don't snack on cookies or candy on a regular basis. I'm a little bit discriminating when it comes to my sugar calories, and mostly indulge if I'm in a restaurant or I'm having dinner in someone's home where a fabulous home baked something is offered. I am the person who upon being seated and handed a menu looks at dessert first. I'm not tempted by store bought ice cream, pre-packaged goodies like Little Debbie cakes, or even dessert for dessert's sake. I am tempted by a wonderful home baked pie, cake or cookie, anything from a bakery in Paris, and some of my favorite restaurants dessert menus. I'm not currently feeling overworked, so I think more work I enjoy doing. In my opinion one of the biggest challenges in this season of 'empty-nesting' is figuring out where to invest my energy. I made a flight connection in Dallas one time, and I've been to Houston, but I think that's the extent of my Texas travels. Hubs and I will be near Austin for a wedding this month, so maybe I'll get a glimpse of the capital. Of the sites listed I think I'd like to see Galveston Island, mostly because I always loved the Glenn Campbell song. I know that isn't logical, but it's the first thing I thought of when I read this list. The other site I'd like to see is the Padre Island National Seashore. The longest stretch of undeveloped barrier island in the world, which sounds like something worth seeing. 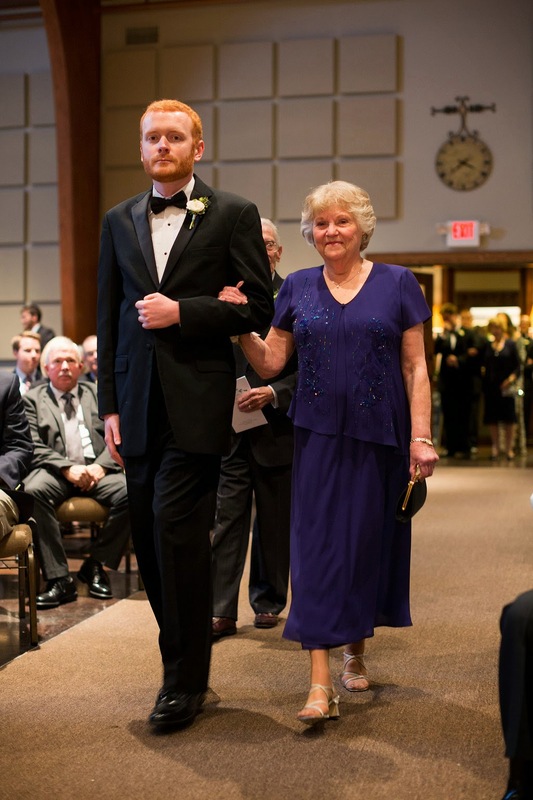 Today is my mother-in-law's birthday, which gives me an excuse to post another picture from the wedding collection. Happy birthday to my very young-at-heart mother in law! You don't need an excuse to post more wedding pictures. Everyone loves seeing wedding pictures. Just wait till July. I'll be flooding my blog with my daughter's wedding pictures. I know that feeling in my stomach of "what's next?" It is the theme of my marriage because at a moment's notice we can be transferred. We are at that point now and debating on how much $ to put into this house. Oh well, it makes life interesting. Hope you sell your house this weekend! On Valentine's Day I was in Panera with my son. Snow, snow everywhere, but when I looked out the window from our table, I saw crocus shoots poking up. My heart fluttered! I snapped a picture. It felt wonderful to see hope in action! Your mother-in-law looks beautiful and elegant. Love that blue color she chose. Really enjoyed today's questions and love that quote by Corrie, what a woman! We sound the same on the sugar deal. And, always love the wedding photos. Happy Wednesday! I love that first time to hear a bird singing too! I also stop and listen to the happy song! I meet with my wedding planner next week for the first time of really going over everything - including Plan B. But, please pray we will have a beautiful day!! I LOVE that quote! I knew I couldn't remember some! I agree 100% with your sugar observations. I am so with you on what's next. It feels....unreal. I will admit I saw a crocus on my walk Monday, I think it jumped the gun as we have several weeks before it will be safe for the flowers to come out. Yes, a lot of things get done when your house is on the market. That is a great quote. I have to remind myself of that fact often! Happy Birthday to your mother in law, that is a lovely picture of her. Lovely mother-in-law, for sure. And happy birthday to her. I love sweets as well, especially chocolate, so I gave it up for Lent! Is it Easter yet? I admit, I glance over the dessert menu first, too. That's a great quote...I've never heard it before. Yes, this empty nest stuff does kind of catch you off-guard a bit. Still trying to figure it out myself. Are you moving just to something smaller or South or maybe out West?! Or back across the pond for a bit???? Inquiring minds want to know... ;) How does one decide when one retires? I'm glad you're doing this first, I'm taking notes. Your MIL looks beautiful!! What a great photo! I love her dress. Happy birthday to her! This is another great Hodgepodge, Joyce. I'm surprised you aren't in the "over-worked" mode with the house of the market. I can't even imagine how crazy I would be!! We have a lot of sweet tooths in our family! My grandpa really loved his soft serve from Fosters Freeze every now and then. I agree with you on sweets, other than candy...home baked desserts are the best. I don't home bake them anymore as Mr BC is diabetic. Take heart, you'll adjust just fine to retired life. It is scary at first but it becomes easier as time passes. You and Hubs will figure it out! I like your quote. Corrie ten Boom is a favorite of ours. We have listened to several interviews with her on Focus on the Family. Your mother-in-law is a pretty lady. I hope she's having a great day. I love seeing the crocus too and I like the quote you shared ..... a good one to remember. Your mother-in-law looks so happy in that photo. Another week of good questions! Living in Texas all my life, it's funny to think some people have never been here! Your mother-in-law looks beautiful! Happy Birthday to her!! I was late posting...I thought really thought I posted it when I got home from church last night....but alas....I did not. Great questions this week....and yes...I DID own a slinky...just forgot to mention it in my answers. Love the Corrie Ten Boom quote. I'm adding that one to my list of quotes. Joyce, I love the Corrie ten Boom quote, "Never be afraid to trust an unknown future to a known God," because I admire everything about that special lady. Speaking of special ladies, your MIL looks lovely and so sweet. Happy Birthday to her! Just use any excuse to keep showing those wedding pictures. Love seeing them. "Texas is a whole other country!" Have you heard that saying before? I've been to many areas in TX and I find that to be true. It's very diverse in climate and landscape. I love most places in TX. That said, I've never been to Austin. Enjoy the wedding and come back and tell us all about it...Girl, trust me, you definitely DON'T have a "sweet tooth" if you can limit your sweet intake that much. I've cut my sugar intake down dramatically but I do have a "little" something sweet each day. Lucky You! It's the Hodgepodge! How Do You Solve A Problem Like The Hodgepodge?